If there were a contest for "biggest tiara in Europe," I'd be hard pressed to think of another sparkler that could best this one. The Empire Tiara owned by the grand ducal family of Luxembourg is a massive diamond fortress of a tiara. At more than four inches tall, it's a giant of the tiara world. Because of its size, the all-diamond tiara has plenty of room for the incorporation of numerous motifs, including geometric, anthemion, and scroll designs. But even though it's such a knockout, its provenance is a bit unclear. This tiara gets its name from its empire style, not because it came from imperial vaults. It's an early nineteenth-century piece. For years, there were two major theories posited about how it arrived in Luxembourg. One traced it back to Romanov Russia via Grand Duchess Elizabeth Mikhailovna, the first wife of Grand Duke Adolphe. The other pointed to Adolphe's daughter, Grand Duchess Hilda of Baden, who died without descendants and may have left jewelry to her nieces. But the ladies over at Luxarazzi have done some digging into the family's jewel inventories, and they have ascertained that the piece was in the family's possession by 1829, making both of those previous theories impossible . So the Luxarazzi ladies have posed a new theory: that the tiara was possibly acquired as a wedding gift for Pauline of Württemberg, who married Wilhelm, Duke of Nassau, in 1829. The German dukes of Nassau became the rulers of the grand duchy of Luxembourg in 1890, when salic law prevented Queen Wilhelmina of the Netherlands from ruling. (The two countries had been in a personal union; it's similar to what happened when Queen Victoria was unable to become Queen of Hanover in 1837.) The tiara came with the new Grand Duke Adolphe to Luxembourg. It's now mainly reserved for the use of the reigning grand duchess or the consort of a reigning grand duke. 1. 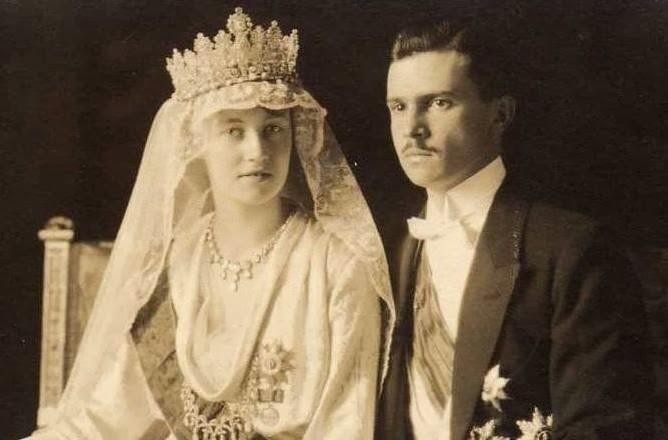 Cropped photograph of Grand Duchess Charlotte of Luxembourg and her husband, Prince Felix of Bourbon-Parma, on their wedding day, 6 Nov 1919. Original image in the public domain. 2. Sydney at Luxarazzi notes that Jakob Tillmann Speltz carried out alterations on the tiara in 1829, but it is not clear whether he was the original maker of the piece; see here. 3. A version of this post originally appeared at A Tiara a Day in January 2013.